It will definitely be difficult to give a fair rating to Putt-Putt -games. Clearly they were beloved by many in their target group, but since PISSED-rating has not been calibrated with children’s games in mind, I fear that the final score will not reflect the memories of people who played them in their youth. Still, I will try to be as fair as possible. I have a feeling that not many children’s games can really get high marks in this category - or at least not if it’s a very good children’s game. It’s not so much a question of unfairness, but of complexity - very small children just don’t have the attention span to follow complex chains of puzzle dependence. The first Putt-Putt game is a good example, since all its puzzles are fairly pedestrian - here are birds, give them seeds. I might have settled for 3, if it weren’t for the repetitive lawn mowing. I know kids often love minigames, but here I can’t imagine even them going voluntarily through this ordeal more than once. The interface is quite intuitive, and the only (and rather minor) complaint I had was the difficulty to identify the hotspots on the screen. The clever idea of making the controls look like a dashboard was a fun touch, even if it took a lot away from the screen. The inventory was quite small, but I can understand that in a children’s game. Besides, it’s quite refreshing that I can see all the inventory items in one glance. Producers of children entertainment sometimes make the mistake of talking down to their audiences. The ultimate fate of this approach is often that the intended audience will eventually get bored. Sure, very small kids will watch Dipsy searching for his hat for the umpteenth time, but eventually they will want more plot. A simple and effective method of making a child glued to his screen is what I would call the but-moment (I guess professionals name it the plot reversal). Just to make it clearer what I am getting at, I’ll just summarise an episode out of the favourite show of my three-year old child, Paw Patrol (plot spoilers follow). 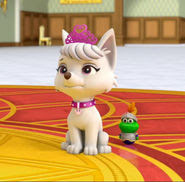 At the beginning of one episode, Chase is assigned to guard a royal crown from thieves (the primary goal of the story), BUT then the crown is stolen by Sweetie, puppy of the princess - Chase knows the culprit, BUT Sweetie locks Chase up and frames him as the thief - BUT, finally, Paw Patrol find Chase and crown and reveal the real thief. That’s three but-moments in just over twenty minutes - and the child is hooked. Come to think of it, even classic children songs knew the power of but-moments. Five little ducks went swimming one day - BUT then one by one all of them disappear - BUT then the power of daddy duck’s quack brings them all back. Frustratingly, the plot of Putt-Putt doesn’t really move that much beyond the search of Dipsy’s hat. 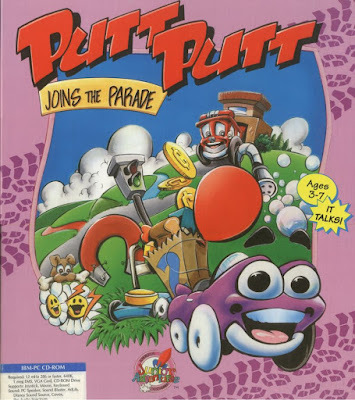 We have the primary goal that Putt-Putt wants to join the parade and has to find some things to get there - and through the course of the game, he just does the required chores and finds those things and gets to the parade. No reversal of the original plot ever occurs. With a plot this thin, I cannot give very high numbers. Music and sound effects in the game, the little there are, are quite unremarkable, so I’ll concentrate on graphics. The high point in this regard is character animation. It is far from realistic to see eyes and mouths on vehicles, but once you accept it, the cars look lively. Putt-Putt’s face is especially quite expressive, and it is easy to read his emotions, even when he is not speaking. Otherwise, graphics never really rise to the level of excellent. True, backgrounds are cutely drawn, but they don’t inspire any awe. What the game lacks in plot, it has in spades with funny moments. I suspect it was all the funny animations that children found so irresistible. Playing and winning is just an afterthought, and the real interest lies in finding all the secret animations and in checking whether a new click would provide a new variation of an already familiar gag. When I remember all the smiles these little details have brought to my face I cannot but give the game high marks. And what’s coming out of that hole? I wonder what does it taste like? I couldn’t believe it at first, but apparently in addition to Jason Ellefson, who does OK job as a chirp and cheery Putt-Putt, majority of the voices were done by one person - Scott Burns, who later became the voice of Bowser - and it is quite remarkable how many different sounding characters he could do. While the acting is thus at least commendable, the dialogue itself isn’t that memorable. (2 + 6 + 2 + 5 + 7 + 5)/0.6 = 27/0.6 = 45. Although I feared of being too harsh for the game, the overall result was still quite high and only nine points away from the other children’s game of the year (Mixed Up Fairy Tales). I feel like I don’t need to adjust the score, so it’s now official. Did anyone guess 45? Yes, Laukku nailed it, congratulations! So, looking at just those would've constituted experiencing the game - no need to play the game itself! Had Ilmari realised that he could've achieved a "playthrough" of around 1 minute! I think the inclusion of all the major plot elements on game box just highlights that this game is not so much about the plot, but about the fun Easter eggs. Although I do wonder why they outright tell on the box that Putt-Putt will get the best spot on the parade - this being the only thing close to a surprise in the plot. 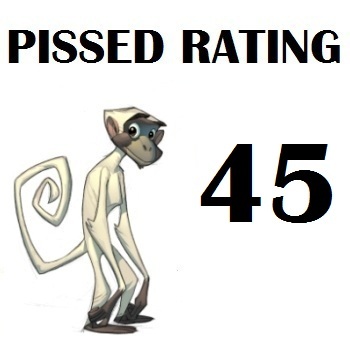 Considering that it beat King's Quest 1 and is just a couple of points behind Inspector Gadget, I'd say that the PISSED system didn't look too unfavorably upon it. Thanks for noticing the error in the spreadsheet! 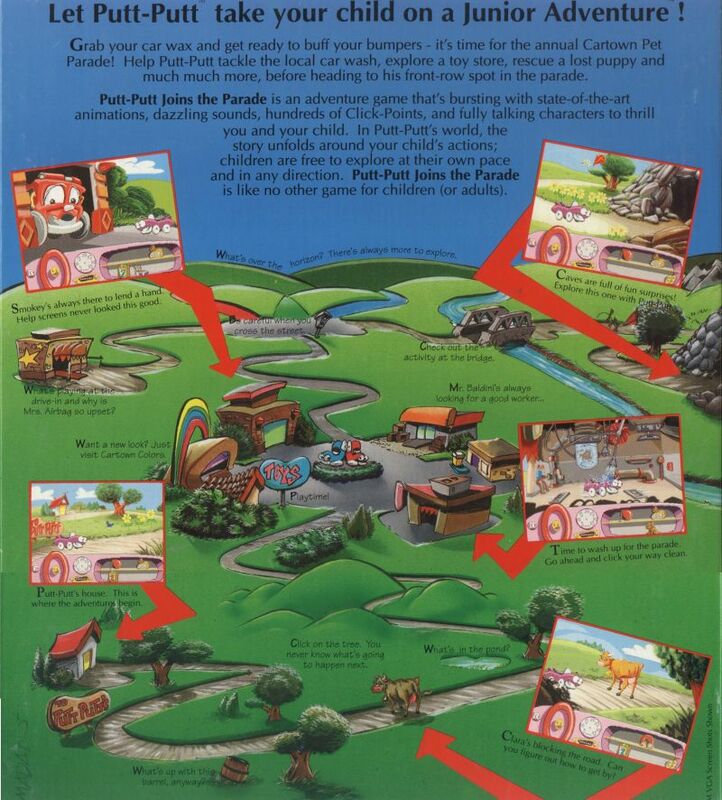 In some ways Putt-Putt was definitely more fun to play than King's Quest 1. It's just short and easy as a game. At least Donald Duck had more variety with its cash-producing minigames. Michael already pointed it out, but I would only get the CAPs if the final score is 47, since my guess was 48. Much as I'd love to accept them, I wouldn't want to cheat out those who were closer. As for the game, I definitely didn't expect many story or puzzle points. The lawnmower mini-game is what I remember most from this one as a child and I remember it being a pain. Humongous Entertainment always did a good job with Easter eggs and animation, however, so I expected those to balance it out. Almost correct. It'd be interesting if their later games are played as we get through the years and see the design improvements, including multiple puzzle paths that change on replay. Still a few years away at this point, but we're getting there. Oh schmuks, this is what one gets, when one ponders the score too much! I started with 47, thought about it for a couple of days, reconsidered some of the categories, got a new result, considered it all again after another couple of days and settled finally on 45 - and forgot to make adjustments in the necessary places. Thanks to both of you, Michael and Biscuit! Honesty is amply rewarded on TAG, as you can see with the new CAP distribution. The next Putt-Putt game is already on the playing list, and if there are multiple puzzle paths to be expected, it will surely score some more points. And nice to get some confirmation that at least one child did dislike the lawnmower section. Ahhh, that makes far more sense. Thanks for the kindness and explanation and certainly congrats to Laukku for getting it spot on! You're right, there is one more on the list, as well as Fatty Bear's Birthday Surprise. All three, including this one, are what I'd consider Humongous Entertainment's early games before they picked up more of a rhythm. The Freddi Fish series is the first one to include the replayability feature, and that's not until 1994. Other than Putt-Putt Goes to the Moon and Fatty Bear, though, it doesn't look like another Humongous Entertainment game made the Accepted list in any year, which I find a little odd considering the pedigree and popularity in their time. Those are still a ways off, however, so we'll see what happens by then. To make it clear, the playing list after 1993 has not been updated for ages and will transform a lot, before we'll get there. So rest assured that there's a good chance that other Humongous games will be put on the list. 1994 always did seem suspiciously short with only 21 games. I wonder how much it will be bloated once you get around to updating it. I mean, 1993 *was* the biggest year, looking at that list, so I can definitely understand the confusion, Joe. I'd forgotten how many huge games came out that year. Sam & Max and Day of the Tentacle were released just a few months apart? That's just madness to me. I had the same kind of score confusion with Castle of Dr. Brain. It was so bad, in fact, that my local files never got updated with the new score. Then when I tried to go back and compare for Island, I got confused because we all were referencing the correct score in the intro post. I almost announced the wrong person getting the right score guess. The mouse eating the discarded piece of gum reminds me a bit of Puzzle Agent and its hint system. I'd say technically the entire endgame is spoiled by the title. Then again, Putt-Putt Attempts To Join The Parade doesn't roll off the tongue as easily. Putt-Putt Joins the Parade - Won! Island of Dr. Brain - Won!